TNA is the 3X Bullish ETF on the Russell 2000. It's the reverse of TZA , thus as TZA has tanked, TNA has surged. 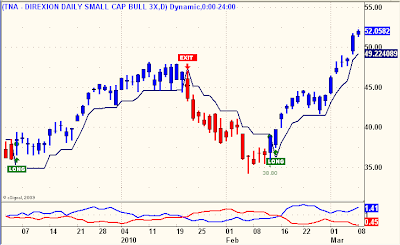 For anyone that might be in TNA basis its most recent Buy Signal on February 12th, here is the Daily Trend Model with it's trailing stop shown. Note how far the Vortex Indicator lines are diverging, something I've noted before that is usually unsustainable, meaning a correction of some degree in TNA is probably in the offing. Still, a nice chart that exemplifies a Daily Trend Model at its best. +-30 percent for the latest buy? Thanks for the comment Mike. One draw back of the subscription service is that if I laud these models with their true due, it rings too much like marketing and loses some credibility. I really do think these charts speak for themselves. Should we be adding nnvc here for those that missed the run up to 1.38? Feel free to boast about your excellent service :-) Its well deserved. However, please stop featuring my favorite instrument (TZA). I have my list of specialty investments for a market turn, but rather then anticipate that turn with the details, I am waiting for the actual turn before disclosing what to buy and at what prices. Is TZA on that list? What would Sarah Palin say? Just takes a pair of steel balls to follow the signals without bias. At the time bloodshed to the longs was fresh in the memory banks. One thing to look at a chart, another to place a bet against the dominant weekly trend. Hindsight, as always, is 20/20. I'd email this question, but can't find an address. I'm just curious where your chart is from. You have mentioned advance get. I have that and am wondering where you get the vortex study and the stop line on the charts. USE YOUR BRAIN, thanks for sharing. It's not as obvious as you may think. The advanced get labeling he uses isn't proprietary to him, nor the oscillators and probably a few other things I could point out. The formula for the vortex is widely available. Not sure how he gets it on his AGET chart. I've read the side bar. Lots of ads for Precter which I think is great, by the way. Just asking. Someone asked if it was a good place to buy. My Charting showed me this would be the Zone for the correction. If you want to keep it simple....my opinion is Yes,but. Keeping it simple is not my style....so I have to add some thoughts. there are also lower s/r points where NNVC can fall to in the coming days and weeks. So its a question of your risk tolerance. the risk is that THIS is the bottom for now and you have to ask yourself ....do you believe NNVC will drop further to the 1.00 area or even to the .90 area,or two months from now to the .80 area. these are ALL key s/r levels. And if it does drop with the market, do you believe NNVC will rise up again....to the 1.40 and far beyond Up and up ? my own opinion is that for first time buyers...this 1.12 area is a high logical trade zone for buying maybe a 1/2 position,based on fibs and s/r and trendlines,etc. For those who already own it at lower prices....it might be interesting to see if NNVC goes lower in the coming days and weeks. This market HAS to turn around sooner or later. That's easy. Something really, really idiotic. i don't believe nnvc will move with the market. This stock seems to be driven by company specific events. Don't know if you saw the article on ihub but nnvc got a nice writeup after the close by some stock newsletter. Some questioned if this was a paid promo. Doc S. says no. Maybe we resume the upward move today. Also, we are overdue for new test results. but at the same time,these still are 'penny stock ' price levels that can swing 50 % in either direction,just from profit taking,or newsletter reviews. and with NNVC,that giant curve ,in technical charting,flows down into the 1.00-.90 area. I'm tempted to buy some more at this 1.12 area myself. Just a portion for trading. I wonder what you think of this idea. I think investors are tuned into the Biotech stocks right now. They have jumped on the bandwagon. They see the popular ones,including those like RDY,that got jumped on last year. Heres my thought..... do you think that IF there is a biotech stock,like NNVC,which is currently correcting,not soaring like the others, that investors,searching for some biotech stock to buy....will see NNVC ....NOW.... and jump on it? I am desperately waiting for GNVC to come down,and its not. I want to look at GILD now. But NNVC right now,just made this giant correction to a key support point. Its like the only piece of candy on sale in the biotech store. should we ignore that and buy NNVC on sale right now? I'm really tempted,at the 1.10 area. IF after buying at 1.10 area,it jumps above 1.20...all you have to do is set a stop sell at break even. I'm watching FAZ closely and if time permits, I'll post a chart along with my analysis later this morning. Right now I'm preparing a top-of-the-hour email update to subscribers (with a little bonus) covering today's first 30 minutes of trading.